YOLO. Do you know what this means? I saw a Colorado vanity license plate with it the other day. It's a saying that's in vogue among young people. It means "You Only Live Once." Yolo is today's take on yesterday's "Carpe Diem!" (Seize the day). It's about living to the fullest, sucking the marrow, making every moment count. Do you live by YOLO? It's an interesting question to ponder. I think it's worth examining. On the one hand, YOLO is full of gusto and go-for-it. It's what can make a person try sky-diving, backcountry skiing, extreme sports. YOLO, no doubt, has led to some epic moments and, likely, some serious morning-after regrets. 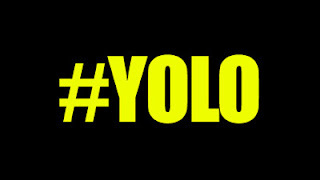 YOLO is filled with Sturm und Drang, or more vividly, piss and vinegar. It's youthful philosophy. But does YOLO have a dark side? I think it might. It could be kind of nihilistic. Like "this is all there is, nobody gets out of here alive, better make it count while I still have breath." Rather than liberating, YOLO could be oppressive or downright depressing. Perhaps it all depends on how you look at it. If this material, earthly existence is all there is, then there is this existential angst and pressure with it: "I've got to live life to the fullest NOW!" Awareness of our mortality can have that effect. I confess I feel some of that in midlife right now. Gosh, where did the years go? I wonder. I'll never be this young again. What changes or adjustments should I make? Life's "bucket list" of bike rides and adventures grows more specific each day. On the one hand, that could be a good thing, if it causes me to live with greater focus and gratitude for each day I have. But YOLO doesn't satisfy me ultimately. It can cause me great regret: what about the time I've wasted? The missed opportunities? The water under the bridge? Ugh! The regret, the pressure, the ultimate finality of this mortal flesh--is that all there is? There's got to be more. And the good news is, there is more! As we make our way to the cross and empty tomb in this Holy Week we consider the life, death, and resurrection of Jesus Christ. As far as we know, he only had about 33 years here on earth--but, boy, did he make them count! Thirty of those years he "wasted" working his trade in the carpenter's shop. Or did he waste them? He learned deeply what it means to share life with people, to embrace joys and sorrows, to feel humanity's pulse throb and surge. Jesus saw first hand the YOLO mentality and the depressive resignation his fellow Jews must've felt under Roman rule. He witnessed firsthand our human longing and desperation. And then, in three short years he made it all "count": proclaiming the hopeful in-breaking of God's gracious kingdom, healing the sick and disabled, touching the leper, raising the dead, confronting injustice, welcoming the outcast. He did it all not because of YOLO but because of something way more substantial and hopeful. God's coming Kingdom breaks through the despair of mortality and suffering. God's light illumines the darkness of death. And, as we will celebrate this Easter, the unstoppable life of Jesus cannot be contained by a tomb. No, friends, in Jesus Christ you don't only live once. You live forever. Therefore, begin living now like you mean it. Let the values and life of Jesus take flesh in your own life. Live with bold confidence that nothing can separate you from the love of God shown in Jesus Christ--not even death (see Romans 8:38-39). Live now as if you're going to live forever. Because in Jesus Christ you will.